There are two palatine bones. 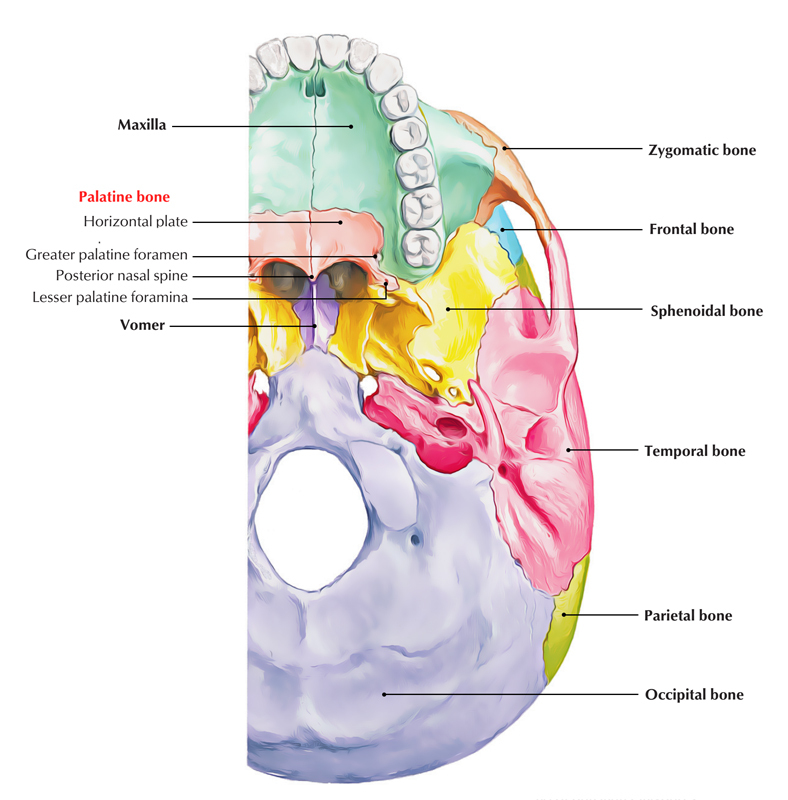 Every palatine bone is lodged between the pterygoid process of sphenoid bone behind and the maxilla in front. 2 palatine bones create the posterior one-third of the hard palate that is why it is called palatine bone. It projects medially and unifies with its counterpart of opposite side to create the posterior quarter of the hard palate. It’s a vertical plate that is fixed with the posterior part of the medial outermost layer of the maxilla. At its upper border the perpendicular plate presents 2 processes: (a) sphenoidal process and (b) orbital process. Between both processes it encloses the sphenopalatine notch that is converted into sphenopalatine foramen by inferior outermost layer of the body of sphenoid. The lateral surface of the perpendicular plate presents a vertical groove, the greater palatine groove. It projects upwards and laterally from the anterior part of the upper border of the perpendicular plate, in front of sphenopalatine notch. It presents 3 articular and 2 non-articular surfaces. It projects upwards and medially from the posterior part of the upper border of the perpendicular plate. It presents 3 surfaces and 3 edges. It projects posterolaterally from the junction between the perpendicular and horizontal plates. The pyramidal process is pierced by the lesser palatine canals. The greater palatine canals run between the maxilla and the perpendicular plate of the palatine. The Le Fort fractures of mid-facial skeleton constantly include the perpendicular plates of palatine bones. The Le Fort I requires the lower one-third of the perpendicular plates, on the other hand Le Fort II and Le Fort III call for the upper parts of the perpendicular plates of palatine.